Dorea is a fourth-year Bachelor of Business Administration student focusing on Marketing and Media Management. She was born and raised in southern part of Germany, near the France border. 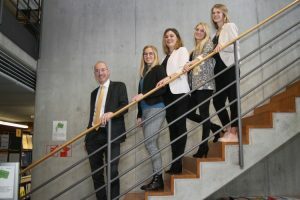 In her semester abroad at the Hogeschool Rotterdam in the Netherlands, she got to know case study and earned more experience by participating in the International Marketing Week in Southampton (UK). At the end of January, Dorea finished her internship in the Netherlands, where she was responsible for marketing in a B2B company. In the future, she plans to pursue a career in international business. In her spare time, Dorea explores new countries, cultures, and cuisines. Magdalene was born and raised in southern Germany. She is a third-year Bachelor of Business Administration student focusing on Social Management. During her exchange semester abroad at the Hogeschool Rotterdam in the Netherlands, she obtained international and intercultural experiences. Moreover, she learned the technic of solving business cases. Magdalene worked as an intern at a German auditing and tax consulting company, which is focused on Non-Profit-Organisations. Through this opportunity, she gained a lot of professional experience and practical knowledge. In her spare time, she enjoys visiting friends around the world and going running or skiing/ snowboarding. Laura was born and raised in Southern Germany. She is studying Business Administration, Marketing, and Media Management at Heilbronn University. Laura experienced great adventures and challenges while studying abroad. She spent a semester in Mexico, attended Marketing-Weeks in Kolding and Southampton, and the Rotterdam International Case Competition in 2017. Through all these experiences, she gained insight on what it means to compete internationally with great characters. Since she is living in a tiny village, she loves to travel and discover new places. Currently. she is writing her bachelor thesis at the cruise company “AIDA Cruises” in Northern Germany. She is looking forward to getting inspired by different nationalities and to challenge herself in Charlottetown at the 2019 NIBS Case Competition. Born and raised in Germany, Kathrin is a 4th year Bachelor of Marketing student, studying Product and Customer Management. She completed an academic exchange to the University of Pittsburgh in Bradford and worked for the sales promotion department at Ravensburger AG. Kathrin – who everyone calls Kathi – is now writing her bachelor thesis before she will start working as a sales person for the insurance company Allianz. She gained her first Case-Studies experience when participating at the elective subject at her University. This was followed by the European Case Study Training Camp and the Rotterdam International Case Competition 2017. Kathi loves playing sports, going out with friends, and travelling around the world. Joachim has been working as a Professor of Marketing at Heilbronn University in Germany since 2002. His main areas of teaching and research are within the field of Brand Management and Customer Management. In addition to that, Joachim is the Internship Manager of the Bachelor program “Business Administration, Marketing and Media Management” at Heilbronn University. Prior to his academic career, he worked as a Sales Manager in the machine building industry, and for a couple of years, as a Service Manager in a software company. In his doctoral thesis, he did research on B2B services in cooperation with Siemens AG.